PHOENIX — The kids head back to school in just a few weeks, and it’s time for moms and dads to start thinking about what to pack in the lunchbox each day! Heather Gill and R.J. Johnson from Modern Day Forager joined Yetta Gibson on Tuesday’s Good Morning Arizona with some ideas for healthier lunchbox and snack choices. “What we like to do is involve the kids in what their choices are,” Gill says. For example, grab a bunch of items like pretzels, nuts, raisins, chocolate chips and cereal, and let the children assemble their own baggies of trail mix. A bento box also lets kids build their own lunches. And using a cookie cutter for sandwiches and fruit lets the youngsters make choices of their own in that area. Make sure to include a “rainbow” of colored fruits and veggies. Bringing your child shopping with you can also encourage them to make better choices, and will ensure that they’ll actually eat what you pack in their lunches. “If you bring the kids along, they’ll pick what they like,” Johnson tells us. You can find cheap, reusable lunch containers at the dollar store or in those dollar bins at Target. Don’t forget the mini-ice packs to keep lunches cool. You can even find some great ice packs in the camping section. We are huge proponents of the classic cocktail. We think any home bartender worth their salt has a few of these in their repertoire to pull out when the mood strikes. But we also love to experiment behind the bar, and one of the coolest, simplest, most refreshing ways to do that in the summertime is sangria. 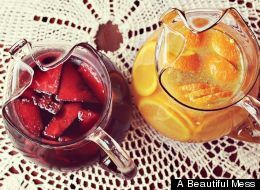 Most sangria recipes are pretty simple: wine + fruit (+ sometimes brandy or another spirit) + ice = pitcher of refreshment. Please, please, please take note of one thing: good sangria does not come out of a pre-mixed bottle. Ever. No matter what Boone’s Farm tries to tell you. Just say no. All you need is a relatively inexpensive bottle of wine, some fruit and an adventurous spirit. 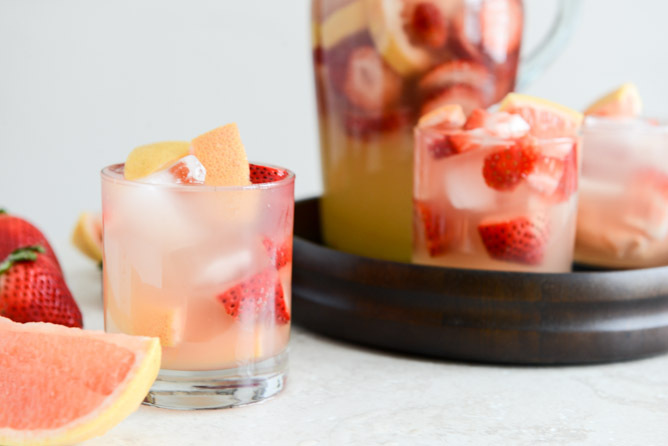 Check out the amazing sangria variations below, and let us know if you have your own favorite blend! Want to read more from HuffPost Taste? Follow us on Twitter,Facebook, Pinterest and Tumblr. If 90-degree weather motivates us to do anything, it’s make cold soups. Because when you trek back home from work, sweating off what feels like all of the water you drank during the day, no other food satisfies quite as much as a chilled soup — and all you gotta do is pour it in a bowl and eat. Once you’ve had your fill of gazpacho and cold cucumber soup, try these other unique chilled soup recipes for a nutritious and refreshing meal. Who says summer soups have to be vegetable-based? Let watermelon steal the spotlight with this watermelon soup from Modern Day Forager. You’ll only need six ingredients (other than water): sugar, basil leaves, watermelon (obviously), lime juice, lime zest and sparkling wine. Awesome site!! Thanks Shauna from Jam in Scottsdale sent me here!! Thank you! We love Shauna! A whole new kind of club…stacked! Creative Director. Original Content Creator- Food.